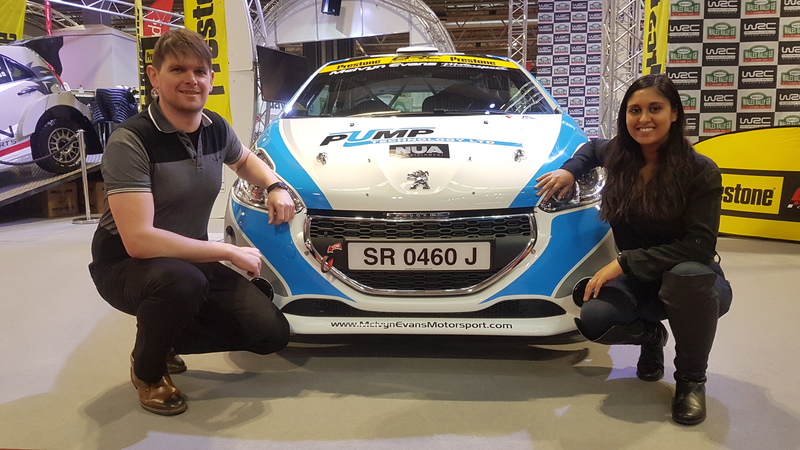 British Ladies Rally Champion Nabila Tejpar revealed her plans for the forthcoming season today (11th January) as she unveiled her new Peugeot 208 R2 at the Autosport International Show in Birmingham. Fresh from taking the 2017 British Ladies title and a solid inaugural World Rally Championship finish at Wales Rally GB, Tejpar will upgrade from her familiar Ford Fiesta R2 to the new machine for her 2018 campaign. The car was revealed at the British Rally Championship stand, inside the NEC at the four-day event (11 – 14thJanuary). In what will be just her third year in the sport, Tejpar has enjoyed a progressive career behind the wheel of the Fiesta and has been looking to further develop her skill set with new challenges this year. Tejpar and co-driver Richard Bliss have confirmed a programme that will involve the 2018 Prestone MSA British Rally Championship but will also look further afield to build on Tejpar’s international experience. She will be sponsored for the third year by Pump Technology and supported once again by NUA Motors, Advanced Chiropractic and Allied Polymer. 24-year-old Tejpar from Maldon, Essex has been rallying since her 22nd birthday and was introduced to the sport by her father Aziz who competes himself in the British Historic Rally Championship. After contesting single venue events to hone her skills, she embarked on her first season in the DMACK British Junior Championship in 2016 with the MH Motorsport squad. In 2017, she ran inside the top three of the Cadet Cup for much of the season, before an unfortunate final round score meant she ended the season fifth. The arrival of the new machine has inspired the Ladies Champion to push the envelope of her abilities this season and is looking forward to seeing what the year ahead holds.“I had a confidence boosting development year in 2017 and after Wales Rally GB we sat down and looked at where to progress this season and the first step of that process was the car” says Tejpar. More information on Tejpar’s full calendar of events will be announced in the coming weeks.